This past weekend saw our first venture into a jewelry store together…and this time, to look at wedding rings for him. With less than 6 months to go, apparently it’s something we should start looking at, at least to get a few ideas if nothing else. My lovely fiancé is not much of a jewelry wearer – having a watch, and nothing else. So the idea of looking for something that he is going to wear and feel on his finger every day is a little daunting, and I expect it to take a few weeks for him to get used to the feeling of having something on his finger. All metals will scratch – whether it’s platinum, gold, palladium or silver. The jeweler showed us his platinum wedding band, which could have been tin from what we saw. Everything will show wear and tear eventually – of course regular buffing and care will help, but over time everything will lose their shine. Pick a ring for life – sounds simple, but take your fiancé’s lifestyle style into account when choosing a ring. If he’s an enthusiastic drummer or a man who works with his hands often, you may want to get more than one ring – one for normal wear, and then a less “precious” one for those occasions where he will be particularly heavy handed. A sense of style – Luke is a fairly classic man, so a thick ring with stones is not going to suit him. 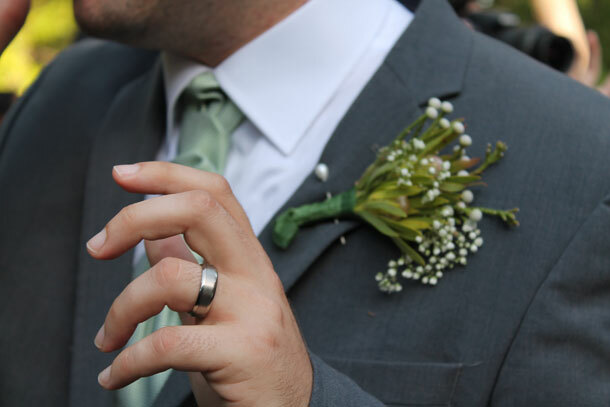 If your fiancé’s style is timeless, then a classic plain wedding band will be perfect. If there’s a little funky style going on, we’ve discovered this fantastic designer who does amazing things with teak and wood inlays. It’s worth looking around – after all, this is one of the few pieces of jewelry he’ll wear for life.